Below is the first in a series of responses to be posted in relation to CSIRO’s answers to Questions taken on notice during the Senate Estimates – Economics Committee hearing held on the 28th of May 2012. Senator COLBECK: Were information management technology division employees advised in 2010 that all except senior management positions would be restructured in that division? Did this result in the loss of around 30 positions? If so, on what date were the employees originally advised of the restructure and what date was the CEO of Centrelink notified? Dr Clark: Yes, we did have a restructure. In terms of the detail, we would be happy to take that on notice and provide you with that distinct detail. Senator COLBECK: So it did result in the loss of 30 positions? Dr Clark: It is certainly in that order. This week, I was reviewing the IMT progress, actually, of the groups following that. I have been very pleased with the way our IMT team has been working. They are a truly exceptional group in the management of our IT systems. And the platforms that we need for the future, which is what this particular group works on, are going extremely well. I am quite pleased with it. We have undergone that restructure of that order of positions. Senator COLBECK: You are not aware of any breaches of section 530 of the Fair Work Act in respect of that particular matter? Dr Clark: I am not, but you did ask for some more specific information regarding dates and we will provide you with that. On 17 May 2010, Information Management & Technology (IM&T) staff were advised that the IM&T function would be restructured with likely impacts on future staffing requirements. The following IM&T staff were not impacted by this restructure: Library; Advanced Scientific Computing: Australian Biosecurity Intelligence Network; iVEC; and two Executive Management roles (the Chief Information Officer and one Executive Manager). All Senior Manager roles were in scope for this restructure. Staff identified as potentially redundant were formally notified on 23 June 2011. The number of staff made redundant as a result of this process was 35. 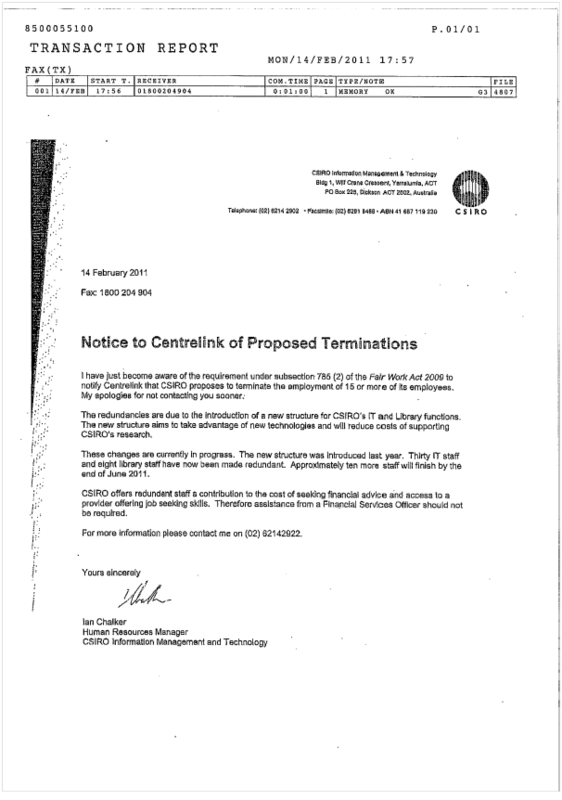 The CEO of Centrelink was formally notified on 14 February 2011. (b) before dismissing an employee in accordance with the decision. The relevant section of the Fair Work Act (2009) can be viewed below. It is also unlikely that CSIRO’s CEO, Dr Megan Clark would have been unaware of such a monumental oversight in what was a significantly risky and sizeable organisational restructure, unless of course she was truly asleep at the wheel. How have the CSIRO Executive Management Team responded to such an example of gross incompetence? …the silence is truly deafening!!! (1) If an employer decides to dismiss 15 or more employees for reasons of an economic, technological, structural or similar nature, or for reasons including such reasons, the employer must give a written notice about the proposed dismissals to the Chief Executive Officer of the Commonwealth Services Delivery Agency (Centrelink). (c) the time when, or the period over which, the employer intends to carry out the dismissals. (4) The employer must not dismiss an employee in accordance with the decision unless the employer has complied with this section. Note: This subsection is a civil remedy provision (see Part 4-1). (b) do not include an order granting an injunction. The Victims of CSIRO group would personally like to thank all those who have contributed and continue to contribute to our campaign. Your sharing of your own personal experiences, assistance with media contacts, legal advice and an ever increasing number of other ways in which you contribute has enabled us to build a significant profile as an advocacy and support group for victims of workplace bullying, harassment and victimisation. The volume and quality of information we have received has allowed us to analyse and understand some very specific patterns in relation to workplace bullying within the CSIRO, and has enabled us to identify a number of key individuals who it is alleged have engaged in bullying behaviour towards a number of different employees. We have also identified a number of patterns relating to the way in which complaints of bullying and other examples of serious misconduct are addressed that would not have been possible without the considerable efforts of a large number of contributors. The recent media coverage of bullying allegations against the CSIRO has led to an unprecedented number of new visitors to the Victims of CSIRO website, many of whom have volunteered their own personal stories. It is of great concern that the number and seriousness of the allegations we have received is significantly in excess of the response we anticipated in commencing the Victims of CSIRO group in mid-2011 and the responses do not appear to be diminishing in number or impact. In fact, quite the contrary is occurring. How the CSIRO Executive Management Team can still continue to publicly deny that the issue exists , and dismiss so many similar allegations as seemingly unrelated in the face of mounting body of evidence to the contrary, leaves us speechless, well almost!!! For those who are regular visitors or even first time visitors to our website, keep the stories coming. The more information we receive the greater our opportunity to achieve change and to see an end to the toxic culture deeply embedded within the organisation. This article was recently published in Occupational Health News. The CSIRO has been accused of misleading a Senate Estimates Committee over its handling of a bullying claim by a scientist, according to a letter former CSIRO scientists obtained under freedom of information. In the letter, Comcare deputy chief executive Steve Kibble demanded the agency correct the Hansard record from May 28, 2012 for failing to highlight its occupational, health and safety breaches in relation to its handling of a bullying claim lodged by former CSIRO scientist Dr Sylwester Chyb. “(The) content quoted by CSIRO was not presented in context and failed to highlight to the Committee that (Comcare investigator Nigel) Docker’s draft report also contains preliminary findings that the CSIRO breached its occupational health and safety duties with respect to its handling of some of the allegations of bullying made by and against Dr Chyb,” the letter said. Comcare criticised CSIRO deputy chief executive Craig Roy for misleading a Senate hearing when he gave evidence a draft report into bullying claims found no evidence of “systemic deficiencies or a culture that embedded bullying at the CSIRO”. Chyb, a leading entomologist who travelled from Britain for the job, alleged he was harassed, bullied and unlawfully terminated by the CSIRO (OHN 929). Former CSIRO employee Andrew Hooley, who was made involuntarily redundant last year after nine years at the organisation, told OHN he had formed a group of 10 former CSIRO scientists who obtained the letter and had placed pressure on Comcare to formally investigate CSIRO’s workplace practices and management culture. He said they had submitted 54 cases of alleged bullying of current and former staff to the parliamentary inquiry into workplace bullying. “We would receive one to two complaints a week from former and current staff,” he told OHN. He claimed bullying and harassment of staff was “rampant” at the CSIRO, generally stemming from “high-level public servants in positions for a long time with no accountability for their actions”. Hooley told OHN he was subjected to public humiliation after raising concerns about potential procurement fraud in 2007. Hooley, a former CSIRO health and safety rep, said some employees were on suicide watch as a result of being bullied. He established a website for victims of CSIRO bullying and estimated up to 100 cases had emerged involving bullying of current and former staff. “A lot of the difficulties people have encountered started off as a result of questioning the legitimacy of processes,” he said. Hooley said staff who reported illegal activity under the organisation’s whistleblower provisions were not protected and many were made redundant. The submission called for tighter national laws, an independent body to investigate workplace bullying claims and stringent whistleblower protections. Hooley said they were seeking a separation of Comcare’s prosecution and insurance arms. A Comcare spokesperson told OHN the regulator had “raised concerns about information supplied by the CSIRO to the Senate Estimates Committee” and that it was discussing the matter with the CSIRO. The CSIRO did not respond before press time. For convenience I have also posted the relevant questions in a zip file posted on our Documents section of the site. Initial review of the material has already uncovered a number of factual inaccuracies as well information which is inconsistent with documentation we have received from other sources to date. This is the kind of childish response we have come to expect from our senior bureaucrats!